This water could be some of the oldest on the planet and may even contain life. Not just that, but the similarity between the rocks that trapped it and those on Mars raises the hope that comparable life-sustaining water could lie buried beneath the red planet's surface. Researchers from the universities of Manchester, Lancaster, Toronto and McMaster analysed water pouring out of boreholes from a mine 2.4 kilometres beneath Ontario, Canada. Before this finding, the only water of this age was found trapped in tiny bubbles in rock and is incapable of supporting life. 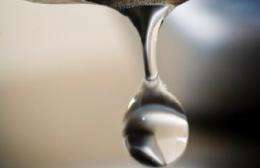 But the water found in the Canadian mine pours from the rock at a rate of nearly two litres per minute. It has similar characteristics to far younger water flowing from a mine 2.8 kilometres below ground in South Africa that was previously found to support microbes.